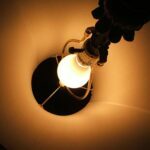 1In older homes, incandescent light fixtures are often mounted directly to an electrical box. 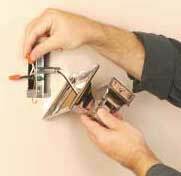 Electrical codes now require that the fixture be mounted to a flat metal bar called a mounting strap that is secured to the box. 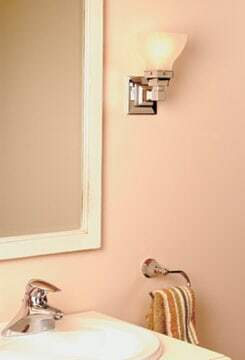 Most new fixtures include the mounting strap and screws. 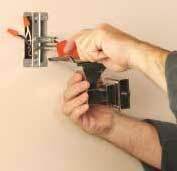 2Before installing the fixture, inspect the wires coming out of the box. If the ends are nicked or tarnished, cut them and strip off 1/2 inch of the insulation with a wire stripper. 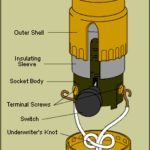 Then, following the manufacturer’s instructions, attach the fixture’s wires to the circuit wires with the nuts provided. 3All lighting should be properly grounded. This is particularly important in a bathroom, where the chance of electrical shock is higher than in other rooms because of the presence of water. In hooking up the ground wire, make sure to follow the manufacturer’s instructions. On many lights, you’ll hook the ground wire to the mounting strap, as shown. 4) Mount fixture to box. 4Mount the fixture to the box as directed by the manufacturer. 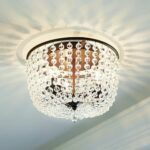 Finally, screw in the appropriate bulbs, making sure their wattage does not exceed the maximum allowable for the fixture. 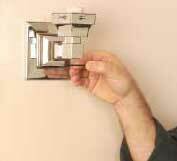 Attach the diffuser, which typically is held in place with a decorative cap or retaining nut. Tighten only friction-tight to avoid cracking the diffuser.